My driver for the night, Long, picks me up from District 2 promptly at 5pm and the tour begins by weaving our way through traffic to Café Zoom in the Pham Ngu Lao area. 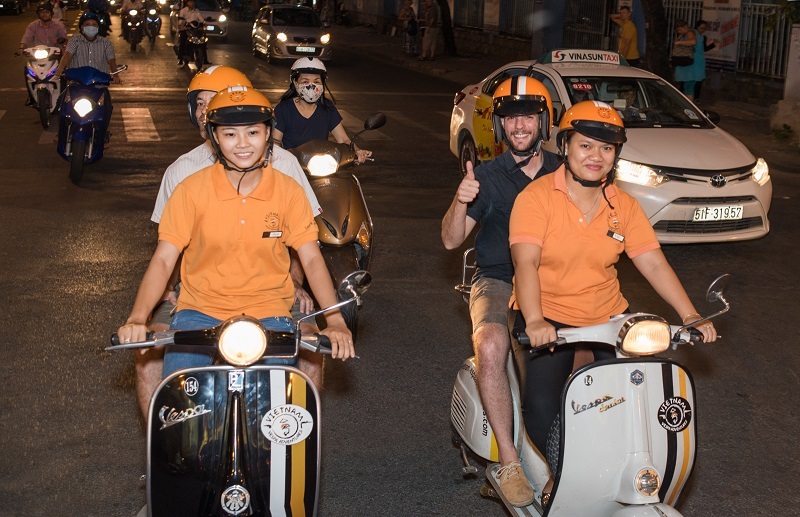 My first observation is that the Vespa’s passenger backrest is quite comfortable—a feature that I will be increasingly thankful for after each of the 17 brews enjoyed during the Vespa Adventures Saigon Craft Beer Tour. 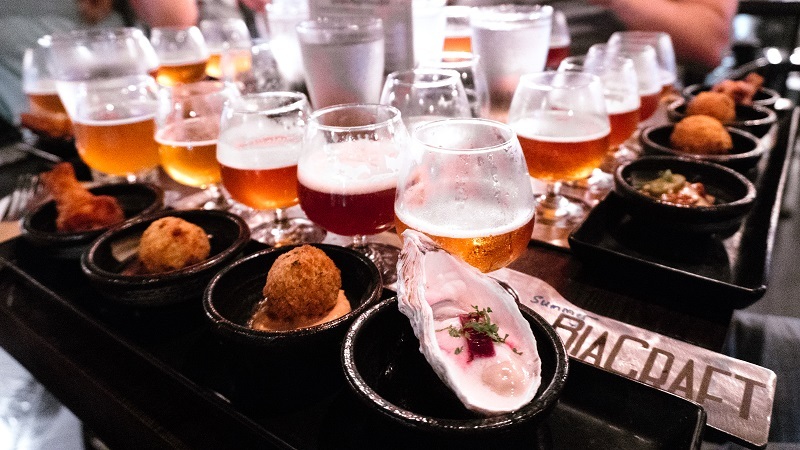 Generally speaking, I’m not a big fan of tours, but an evening spent drinking good beer and eating delicious food around the city is a little different than what typically comes to mind when you hear the word “tour”. 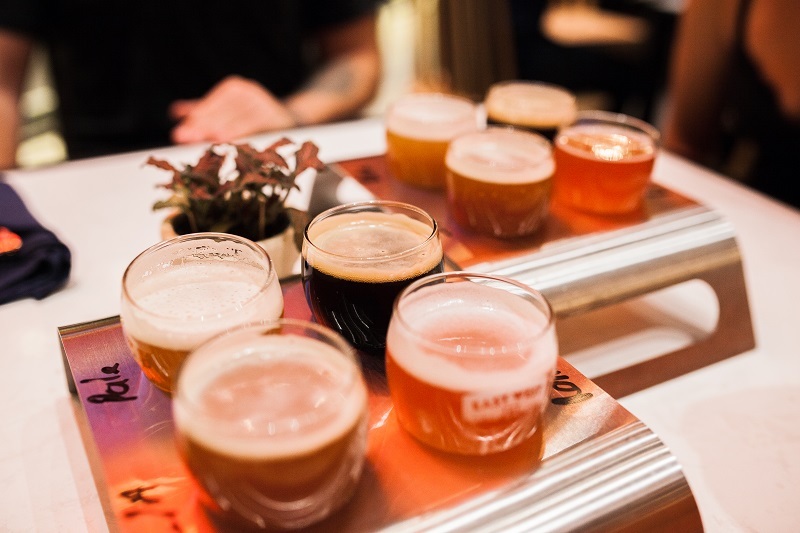 There are only a handful of cities in Asia that could offer such an experience of local microbrews, and in Saigon, where the craft beer scene continues to grow at breakneck pace, it’s a subculture worthy of exploration for all local and visiting beer enthusiasts alike. As the group trickles in to Café Zoom, the drinking commences with a citric Te Te White Ale—an appropriate choice to start things off with one of the original players in the city’s beer movement—and our convivial guide, Lunar, informs us of the lineup we’ll be visiting: BiaCraft, Heart of Darkness Brewery, East West Brewing Company and Rogue Saigon. What becomes clear as we all become acquainted is that beer is the common denominator bringing people together from all walks of life. There are two middle-aged American men, the sort you would expect to find on such a tour, one woman from Brunei (coming from a country where alcohol is banned, the irony of her passion for beer is not lost), and three 30-something ladies from Saigon, who, as it is later revealed, are scouting the tour for a possible partnership with the high-end travel outfit they work for. We are a motley crew and, yet, with the help of hoppy libations, it quickly feels as if we’ve known each other for some time. Of course, learning the local culture is an important part of any tour, and Lunar makes sure all are aware of the customary mot, hai, ba, do! as we drain the first round and soon head out in a swarm of rumbling Vespas. Each of us has already selected a flight of four beers from BiaCraft’s extensive selection, accompanied with food pairings that complement the flavor profile, but first we are greeted with a welcome beer and spend a few minutes chatting with owner Mark Gustafson. It’s hard to go wrong navigating the beer menu here and even harder to choose a favorite, though, for me, the combination of the crisp Xau Ma Chanh (Ugly But Vain) IPA and a Reuben risotto ball was a revelation. Quickly taking a step back to my reluctance toward group tours, one of the causes of this condition is a dislike of the small talk that comes with it. On this tour, however, the flow of craft beer makes for a flow of entirely more entertaining conversation among strangers. It’s about halfway through our visit to BiaCraft, for example, when one of the Americans begins explaining, in perhaps slightly too much detail, just why he loves the ao dai so much, and then insists that we “do a mot, hai, ba, do for the ao dai,” to which the three Vietnamese women can only giggle. Before long, it’s time to saddle up and the gang of Vespas is back on the road, headed for Heart of Darkness Brewery. A relative newcomer to the scene, they are making up for lost time with a seemingly endless list of offerings (according to their website, Heart of Darkness has 33 beers on rotation). Just in case anyone became thirsty during the ride, we are again greeted with a welcome beer to hold us over while selecting a flight of three. At 7.1% ABV and 102 IBU (International Bitterness Unit) Kurtz’s Insane IPA is a must-try for any hops lover, but if you’re looking for an unconventional tipple, Charlie’s Chocolate Chili Stout, made with local chili and cacao nibs, is like a dessert with alcohol. The feeding continues here, as well, accompanying beer with its old best friend: pizza. But, not just any pizza, Pizza 4P’s. Our next stop takes us down the street to East West Brewing Company’s decidedly upscale location. The only bar in town where the brewing actually takes place, large copper brew kettles are on full display so that everyone knows beer is priority number one. Here, our flight of four consists of a Pale Ale, Saigon Rose, Summer Hefeweizen and Coffee Vanilla Porter. Each is delicious, paired with equally pleasing food, and pushes us all closer to inebriation. We must press on, though. And having devoured the fish tartine, chicken wings, BBQ pork ribs and pork sandwich, it is time to make way to our final stop: Rogue Saigon. Arriving at Rogue just before a light rain begins, we ascend to the rooftop, where yet another welcome beer awaits us. By this point, the group is all well acquainted and we take our time as the evening winds down, sipping Fuzzy Logic APA, Original Apple Cider and Devil’s Lake APA while we share travel stories and exchange contact information. If memory serves right, potato wedges were involved, too. 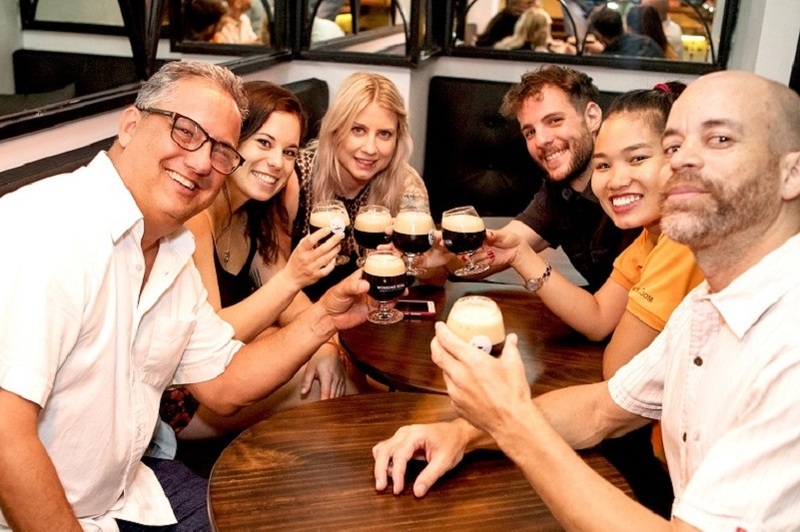 Lunar and the team of drivers have seamlessly guided us through a night of nonstop consumption, leaving us all in the know of Saigon’s craft beer community and feeling good (until morning arrives). My final thought as Long drives me back to District 2 is that this is a tour I would gladly go on again. 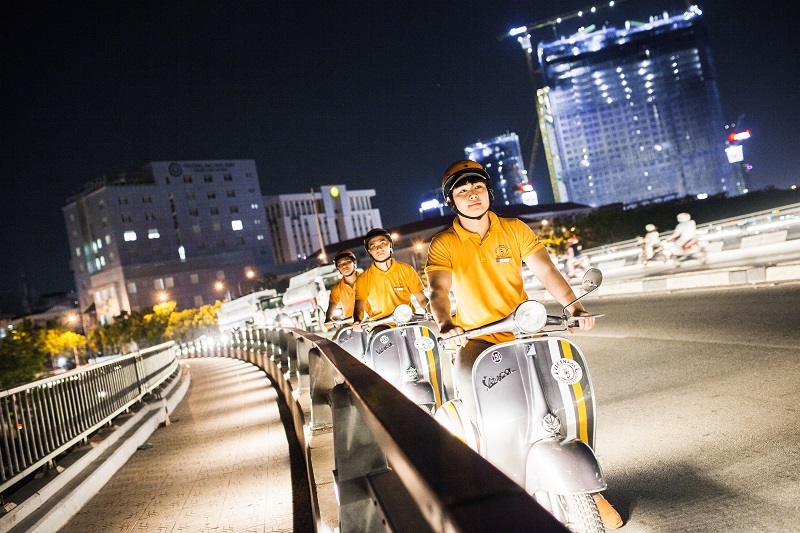 The Saigon Craft Beer Tour is operated by Vespa Adventures and runs nightly. To book or for more info, visit vespaadventures.com or call 0122 299 3585.